The beautiful, petal-like shells of galaxy PGC 6240 are captured in intricate detail by the NASA/ESA Hubble Space Telescope, as seen in this stunning space wallpaper. The beautiful, petal-like shells of galaxy PGC 6240 are captured in intricate detail by the NASA/ESA Hubble Space Telescope, as seen in this stunning space wallpaper. 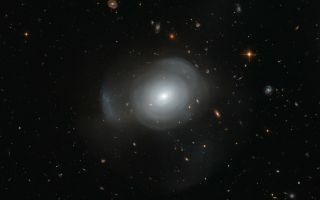 PGC 6240 is an elliptical galaxy in the southern constellation of Hydrus (The Water Snake). It is orbited by a number of globular clusters that contain both young and old stars — thought to be a result of a galactic merger in the recent past. This image was released Oct. 10, 2013.